Egypt's Nature Protection Department, in collaboration with the Environment Police nd Giza Zoo, said they were able to seize five African lions that were found at a warehouse in the possession of a smuggler in Abu-Zaabal settlement in Al-Qalubeya governorate. According to the information received by the Nature Protection Department, the five African lions originating from South Africa were set to be illegally sold in violation of Environment Law No. 4 of 1994 and international conventions banning the trafficking of endangered wild animals. Khaled Allam, the Head of the Central Department of Biodiversity, said that as soon as the information was received by the nature protection sector, all measures were taken in coordination with the Environment Police and enlisted authorities to save the animals. The lions were identified as three females and two males that were brought into the country without valid official documentation. 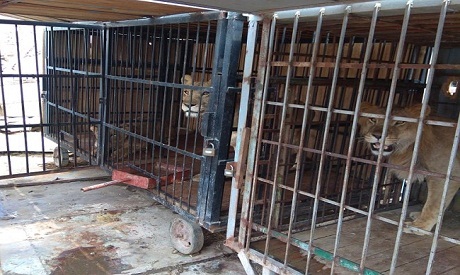 The lions were examined by the veterinary department before they were transferred to the Giza Zoo. The Egyptian Environment Law prohibits the possession of any living organisms regulated by international conventions signed by Egypt, especially predators.